Welcome to New York City's most popular cooking class -- now in a book! This vividly photographed manual is a peek inside culinary instructor Jennifer Clair's best-selling class her cooking school, Home Cooking New York (homecookingny.com), where just six cooking techniques lay the groundwork for a solid culinary foundation. You'll learn the proper way to handle a chef's knife, cook meat to perfection, create impressive pan sauces, and prepare restaurant-worthy vegetable dishes. Plus, you'll discover which ingredients truly make a difference in a home kitchen (kosher salt, extra-virgin olive oil, and Parmigiano-Reggiano cheese, to start). Each technique chapter includes a collection of flavorful recipes, so you can practice your newfound skills while cooking delicious meals. And throughout the book, myth-busting "Students Ask" and "Chefs Say" columns feature pearls of indispensable kitchen wisdom (why you should never mince basil, mint, or sage; why blanching vegetables is better than steaming; what are the three key flavors that make all food taste better; and more). Confidence is what makes a great cook, and this practical culinary guide is filled with the teachings you need to gain control of your kitchen. 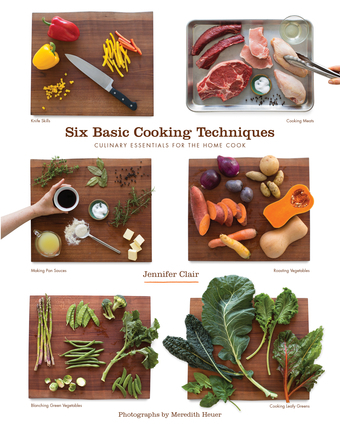 Jennifer Clair is a culinary instructor and the founder of the cooking school Home Cooking New York. She honed her culinary and editorial chops as a Food Editor at Martha Stewart Living and the Recipes Editor at The Wall Street Journal. She is the author of Gourmet Cooking on a Budget. She lives in Hudson Valley, New York. Meredith Heuer is a lifestyle photographer, focusing on personal portraits, food, and travel. Her work has taken her around the world for publications such as Fortune, Gourmet, and The New York Times. She lives in Beacon, New York.